How do you choose your grocery store? Is it based on selection? Prices? Convenience? Size? Sales? Redeeming of coupons? If you’re like me, you shop at a number of stores. Each has its advantages and disadvantages; as a frugal shopper you’re probably trying to maximize the gains while minimizing the expenses. These stores are the nicest; they have in-store bakeries, fully stocked wine aisles, lots and lots of selection. Plus, they’re nice to shop in, clean, well organized, with friendly staff and short(ish) lines. Think this is all a dream? Our neighborhood Carrefour is like this. Of course, you end up paying for such lovely surroundings, but I continue to shop there for two reasons. The first is a 5% discount on store brand products, some of which are available much more cheaply than anywhere else, and the second is their line of green cleaning products, again, cheaper than elsewhere. How do I maximize my spending? I only buy store brands and I usually only shop when there’s a sale going on. Every few months Carrefour will offer thousands of products for half or two thirds off, and then I stock up. Otherwise I try to avoid the place- it’s too expensive! There’s another large grocery store chain in France, LeClerc, that I often shop at. The selections aren’t quite as nice nor as extensive as Carrefour, but there is a wide range of products nonetheless. Most importantly, they’re cheaper. I tend to do a lot of my shopping there because of one factor; one of the stores close to me gives â‚¬5 in store credit for every â‚¬50 spent on Thursdays. Last year I saved quite a bit of money this way, nearly â‚¬400. These are stores like WalMart, that compete solely on price. While we don’t have WalMart here, we have a few rock-bottom priced chains like ED or Lidl. The shopping experience isn’t quite as nice (products are piled high on pallets on the floor for example), but who really cares when you can get such good prices! I buy a lot of staples at these kinds of stores: cat litter, spaghetti sauce or yogurt for example. Unfortunately, this kind of grocery store isn’t very present in France. How I would love to go to Costco! There are a few that I shop at, mostly for the convenience factor. I love being able to shop for groceries in my jammies at 10 pm on a Saturday night (yes, I have nothing better to do than grocery shopping at 10 pm on a Saturday night, sad isn’t it). I love having the groceries delivered to my door. What I don’t love is the lack of selection, nor not being able to pick everything out myself. The last time I ordered groceries online, for example, the oranges weren’t ones I would have chosen myself, and the honey was slightly crystalized. While the shop cheerfully reimbursed my money, it was still a hassle. One of my favorite online stores however, has a unique proposition; it offers locally produced (and sometimes organic) products from the region in which I live. I love being able to support local businesses, not to mention the ease of being able to buy from multiple producers online. When shopping at multiple stores, the most important tool is a price book, or at least an understanding of the per unit cost of each item. For example, I know that I can buy regular price diapers for â‚¬.09 per diaper at LeClerc, so when I see them on sale for less I know to stock up. The same goes for all our commonly used products. Another important tool in the money saving toolbox is the store loyalty card, without which you won’t have access to many of the discounts available. Originally conceived as a way to keep shoppers loyal to one store and one store only, these loyalty cards are now goldmines of data for the companies. But they can be goldmines for the consumer as well, as long as you understand their policies clearly. I probably rotate through all the above stores on a monthly basis, without a formal pattern. Although it might seem complicated to some, doing so saves me money! What’s your grocery store strategy? How many stores do you shop at? Are you a member of any of them? Do you use coupons? Let’s hear your money saving food shopping tips! So lucky! I have one grocery store in my town. The next nearest store is 30 miles away and it's the same chain. If I want to go to a wholesale store I have to drive over 2 hours. I do have a Walmart 30 miles away so that helps a little. Basically, I plan all of my shopping around the sales of our one store compared with the coupons I have on hand. I save up coupons and make a trip to Walmart for personal care and paper items. In a way, it's a lot less complicated but I'm definitely missing out on the savings of multiple choices. This is something I struggle with. There's a cheap grocery store we frequent that has very few name brands – so we don't use coupons. Then there's a megastore we like to check on, they clearance produce (something none of the other stores around here do). We love getting cheap produce almost as much as the challenge of using what we get when we have no idea what's going to be available. Other than that, and the day-old bread store, we also use Great Food For All, which sells boxes of frozen food valued at $70ish for $30. It works for us, as a family of 3 we can keep our grocery expenditures under $150/month. A big deal for us, the first time I kept track, we spent over $500! We have 3 grocery store options in my town: a Walmart Supercenter, a local full grocery store, and a small organic grocery store. I shop 90% of the time at Walmart (prices are unbeatable and it's convenient to buy everything in one place) and 10% at my local grocery store (coupons or super sales on things like cereal, soda, or meat). I never shop at the organic store because it is just too expensive. When it comes to grocery shopping, price is my MAIN deciding factor, no doubt. I only shop at one store, at least for groceries. It's got everything I need, it's fairly large and I live only 3 minutes from it. Can't beat that. It's just a normal store, not something large like Costco, but the prices are good, especially with my loyalty card. To me the most important factor is convenience, since I’m not a big fan of grocery shopping, so this one makes it easy for me. If I had to go to multiple stores I think I’d hate grocery shopping even more. Even though I really don't like Walmart they nearly always have the best prices so I do the majority of our shopping at a local super center. I am not fond of their produce though so I watch the flyers from the local chains and pick the store with the best produce sales to round everything out. For special treats I go to Whole Foods, but I can't justify spending the money to actually get our groceries there, though the bulk bins can be helpful on occassion. We live in a small french village and have a similar shopping strategy. I have just started a price book as we are having to be even more careful. Most shops are 20-30 mins away so I rotate the main weekly shop depending on the offers but I also have a list of specialities that I stock up whenever I am in a particular shop – Leclerc has Alpen and my favorite mayo, LeaderPrice has really spicy tortilla chips, cheap bin bags and good sun-dried tomatoes, Lidl has fantastic cashew nuts and is the only place I have seen pecan nuts, dried cranberries and bagels!! Sadly the nearest Carrefour is over an hour away. As much as I hate to admit it, I do the bulk of my shopping at the WalMart Super Center. It's convenient and affordable. Working full time, I don't care to spend an entire day of my weekend going from store to store to gather our food. I prefer to buy my fresh produce at the upscale grocery store, Dillons, as it is much better quality than WalMart. I wish we had a Whole Foods store but it saves me money by that not being an option. @SyrahSuzie, Lidl has bagels??? I'm there! I shop at the supermarket closet to my house. It has a large variety and I always find what I want. I also have a store bonus card to get additional savings on store items. You overlooked IKEA which has excellent coffee, cookies , jams and prepared dinners among other foods perhaps too exotic to a nonScandinavian. Except for bulk products at Lidl and variety at Carrefour, I have priced foods in city centre often as cheaper. I have ruined my freetime fighting for parking spaces, and driving a tanklike cart around an enormous store pushing everything except that simple milk I need. French hypermarkets are overrated! I just found a giant grocery store that is unbelievably cheap, as well as clean, quiet and open late. (I regretfully inform you that you're not the only one who likes to do her grocery shopping on saturday night – i am sad also). I used to shop at Loblaws – more expensive, I admit – but with great sales and, when I lived in Toronto, I was desperate for nice places to shop so I sometimes paid a little extra to avoid battling the crowds. I also enjoy our farmer's market, although it is much more expensive so I am going to reserve it for it's specialities: local artisan cheeses, humanely raised meat & mennonite eggs. I do most of my shopping at a store called Winco and Costco. At Winco you have to bag your own items but the prices are excellent. I don't use as many coupons as I should but I don't buy a lot of the items that the coupons are for. I think the pricebook idea is excellent. I have used one for years and it has helped me stockpile groceries at their lowest prices. I live in a small town without tons of selection. I shop at the store with generally lower prices for much of my groceries but also make regular trips to Shopper's Drug Mart's grocery section where I tend to find excellent sales on items I regularly use. A couple times a year I order from "Grainworks", an organic food co-op of sorts; I buy huge sacks of brown basmati, black-eyed beans, etc. I also buy eggs from a young girl raising her own hens and 1/4 of a young, locally-raised beef, each spring. A friend who shops at Costco picks me up boxes of edamame from there. A couple times/year, when I go into the city I stock up on big bags of rice from the Chinese Market (and a few other things). So more and more I am shopping from a variety of sources- no longer looking at price alone but also at best quality for my food-dollar. We are in Canada and spend about $850/month on groceries & cleaning products for a family of five. I shop at a Safeway that is between home and work. Whether I'm driving or on the bus, it's the quickest and easiest place to go and it's open until midnight (I work late evenings 3 times a week). My daughter's school also does a fundraiser with Safeway gift cards for part of the year. I don't save any money with them but the school gets back something like 8% of the cost of the card and that's nice. Once every couple of weeks I go out of my way to Superstore, which I hate (long lineups, have to bag your own groceries) but it has much better prices on certain items and is the only place where I can get some others. And I go to the kosher deli weekly for kosher meat, bread and cheese products. We have about three different grocery store chains, two different warehouse options, and then, of course, Wal-Mart. I base my choice on price, convenience, and store brands. We have this store here called H.E.B. that is on almost every major road in this area, has super competitive prices, and their store brands actually taste good. It's usually fully stocked, except late at night when I like to shop to avoid the crowds and rude people, but otherwise I find what I need. I wouldn't shop at a high end store. For me, it's not worth paying more. In this area, the higher-end stores aren't necessarily cleaner, their lines are just as long, and their employees are just as rude. I'd rather pay less and have more convenience. That's just me, though. 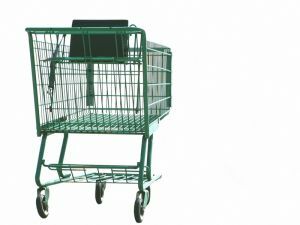 At 16 I rescued abandoned shopping carts in the parking lot and asked, “Paper or plastic?” For nearly two years I worked at Shaw’s, a regional grocery store, which uses a rewards card for sales. After a short period of time, I understood the truth behind sales and became skeptical of the rewards card. Unlike Cosco’s annual member fee, the Shaw’s card requires no contract or signup fee. Customers are asked to present their card at the beginning of a checkout transaction and trust items on sale are honest deals. Truth be told, some items were on sale to beat expiration dates or empty an overstocked stock room. Similar to many stores, Shaw’s sold an arrangement of 3-liter generic sodas. Each bottle was fashioned with a large, orange 89-cent sticker. Ironically, Shaw’s advertised the same sodas, without the stickers, as ten for ten dollars during a week in July. The original price and stickers returned the following week as I became skeptical of the rewards card. I quit shortly after. As a frugal college student, I shop less at Shaw’s, or other grocery stores using a rewards card, and more at locally owned grocery stores or farmers markets. Here are some reasons why: fruits and vegetables are locally grown and fresher, the shopping space is less congested, shorter checkout lines, and no rewards card gimmicks.